Leslie Hambrick goes from a Marine that is a cardio queen to a sculpted body to become an IFBB Figure Pro in the Masters Figure Over 45 division. I’m a wife and mother of two and work as a group fitness instructor for L. A. Fitness in the Cincinnati, OH area. I spent 13 yrs in the Marine Corps and realized how satisfying it was to mentally and physically challenge myself. I have a strange addiction to horror movies and Halloween is obviously my favorite holiday of the year. I’ve always been active and fit, but I’m very proud that I made the decision to step on stage and compete in a figure competition. I trained very hard and my transformation was mind-blowing. It was then that I realized that anyone can change their physique with the proper direction in training and nutrition. I found that in Julie Lohre's Online Contest Prep Training. And of all the shows I have done, I am most proud of becoming an IFBB Figure Pro by placing 2nd at the 2018 Masters Figure Nationals in the Over 45 Class D! I started out weighing 124 lbs, but I have replaced fat with muscle. I used to be 124 lbs wearing a size 2, now I have more muscle mass and less fat and wear a size double zero at the same weight of 124. Proof that the scale doesn’t tell you everything! I love the daily challenges and pushing my body to a whole new level. It’s like a competition against myself ~ constantly competing against ” Last-Week-Leslie.” Sometimes I get compliments from members of my group fitness classes saying that I’m an inspiration to them. That drives me to push harder ~ and always try to lead by example. Healthcare is expensive! LOL! Really, it is a factor for me. I’ve had people I love and care about fall victim to medical issues that could have been avoided by proper nutrition and exercise. Being healthy is a way a life, not a fad. Julie Lohre has been there as my figure competition coach since day one of my competition-path. She’s provided exceptional advice not only about proper diet and training, but about the reality that goes along with being a figure competitor. She literally tells you what type of figure competition suit to wear (style, color, size), how to do (or not do) your makeup, what to expect at fitness events (before, during, after), and helps you pose over and over again so you’re 100% ready on show-day. 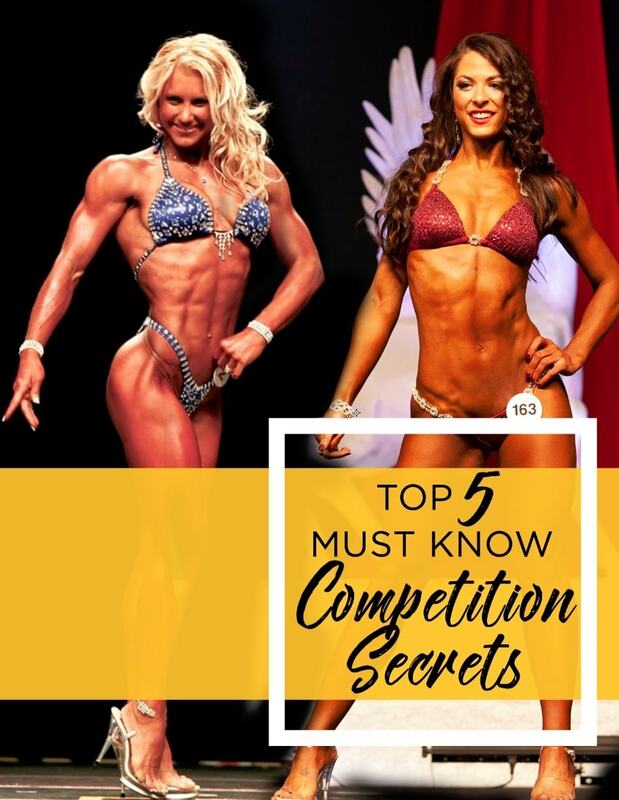 Julie Lohre not only knows how fitness competitions are run, but she’s experienced them for herself so she’s able to give the BEST advice possible. After being in the marines for so many years, I have a warped sense of humor ~ and Julie definitely deserves a cash prize for dealing with my silliness. No matter how much I practice posing, Julie does it 5000 times better and makes it look EFFORTLESS!!!! Beverly International UMP Protein Vanilla with water (mixed to a pudding consistency) with a handful of Quick Oats (uncooked) and/or raw almonds! Delish!!! Quick & easy when you’re feeling lazy! "There are sooo many things I enjoy about fitness. It gives me an emotional and physical high that can’t be duplicated. I love the feeling of accomplishment when I finish every work-out."